Like many Star Trek fans, I prepared for Star Trek: Discovery by re-watching episodes of the franchise’s five previous incarnations, especially The Next Generation (1987-1994). While the Star Trek universe represents a peaceful, just future, I was surprised by how each show is also constrained by the prejudices of its creators. Star Trek has regularly represented Black, Asian, and Latinx characters in positions of command, but has often failed to imagine women as autonomous individuals. Perhaps the most telling example of how a vision of future social harmony cannot quite come to grips with gender parity is the portrayal of warp physicist Dr. Leah Brahms. Dr. Brahms first appears in “Booby Trap” 3.6, but the episode is focused on Geordi La Forge, the Enterprise’s Chief Engineer, who has had trouble getting dates. When the Enterprise is caught by a mysterious force that drains the ship’s energy, Geordi needs to reorient the ship’s dilithium crystals (the key power source of all Star Trek energy). When he consults the relevant schematics, drawn by Dr. Brahms, he recreates the prototype of the crystal chamber, along with a virtual replica of Dr. Brahms, on the ship’s holodeck. LAFORGE: Leah, did you design this? LAFORGE: … What's the inside story? Off the record. COMPUTER: Access denied. Personal logs are restricted. LAFORGE: Great. Another woman who won't get personal with me in the holodeck. Dismayed by the facsimile's demeanor, Geordi asks the ship’s computer to approximate her personality because the robotic persona is off-putting. Instantly, the holographic Dr. Brahms is a warm, friendly, persona admonishing him to call her “Leah.” They have a good relationship discussing physics and working to solve the ship’s energy problem. She even massages his shoulders to make him “feel good” and offers to cook him pasta. 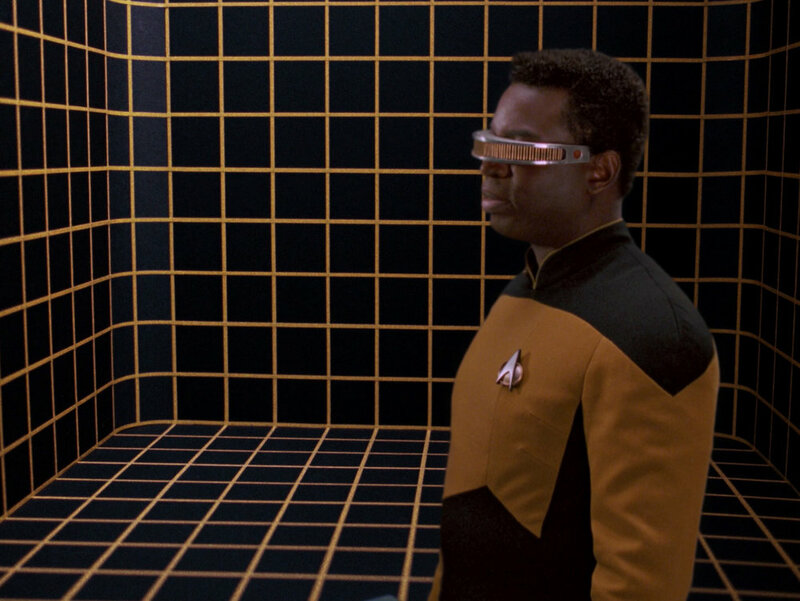 When the real Dr. Brahms appears a season later in “Galaxy’s Child” (4.16), the show had an opportunity to grapple with the consequences of Geordi’s holodeck fantasy. Instead, it uncritically accepts the toxic consequences that many women face in professional environments as the object of another’s fantasies. The real Dr. Brahms beams aboard to tour the Enterprise with Geordi, but immediately notices that he is acting unusually friendly towards her. Geordi even invites her to his quarters for a private dinner. At first she is taken aback by the informality, but takes it in good faith. She opens up about how she has to make apologies for her professional, detached manner that others interpret as coldness. Throughout the episode, she is portrayed as unfriendly and unyielding. Even her metallic dress looks more like armor than wearable clothes. While Dr. Brahms is investigating the modifications Geordi made (with her facsimile’s help) in “Booby Trap,” she chances on the program that Geordi created—and saved—of her. She rightly blasts him, “I'm outraged by this. I have been invaded. Violated. How dare you use me like this? How far did it go, anyway? Was it good for you?” A fair criticism, right? GEORDI: Ever since you came on board, you've been badgering me and I've taken it. I've shown you courtesy, and respect, and a hell of a lot of patience. Oh, no, no, no, wait a minute. I've tried to understand you. I've tried to get along with you. And in return, you've accused, tried and convicted me without bothering to hear my side of it. So, I'm guilty, okay? But not of what you think. Of something much worse. I'm guilty of reaching out to you, of hoping we could connect. I'm guilty of a terrible crime, Doctor. I offered you friendship. Dr. Brahms is allowed no rebuttal and thus no identity beyond that of being another woman who has rejected perpetual-nice-guy Geordi La Forge. LEAH: I wouldn't change a thing. Except for the way I behaved. I guess I came here with my own set of preconceptions about you. The Next Generation has several positive portrayals of women scientists. It goes out of its way to represent women in command positions, but it should not be uncritically lauded as progressive, as any Star Trek remains an imperfect testament to a promised utopia that is always falling short, both in their timeline and ours.